Cal Nichols | Gasland Properties Ltd. Profile of Cal Nichols, C.M. Cal was born in Paradise Hill, Saskatchewan and began his business career in 1962 as the Esso Agent in St. Walburg, Saskatchewan. Cal and his wife Edna moved to Edmonton in 1969. He worked for Imperial Oil as an Agency Supervisor for three years. Following that, he was appointed the Esso Agent in Edmonton until he left the company in 1982. Subsequent to the de-regulation of crude oil and natural gas marketing in 1983, Cal and two associates founded Northridge Canada Inc. which became the first private crude oil and natural gas marketing company in the country. Northridge was ultimately sold to TransCanada Pipelines. Cal created Gasland Oil Ltd. in 1985, which grew to over 50 branded independent petroleum outlets in Western Canada. 1996 saw Cal sell all of Gasland's petroleum marketing business, retaining Gasland Properties Ltd.
Cal is best known locally for his commitment to retain NHL hockey in Edmonton. He co-chaired the Friends of the Oilers ticket drive in 1996. The campaign resulted in more than doubling the season ticket base to 13,000 which was required by the League, therefore averting the risk of the team moving. The Oilers franchise was put up for sale in 1997. Nichols spearheaded the bid from the Edmonton Investors Group by raising the $110 million required to purchase the Team. Established in 1997, The Edmonton Investor's Group was the limited partnership that owned the Edmonton Oilers National Hockey League Franchise. EIG initially consisted of 38 investors when the purchase of the Oilers was completed on May 5, 1998. Prior to the sale of the Oilers to Daryl Katz in June 2008, EIG, with more than 30 individual shareholders, was the largest ownership group in the NHL. 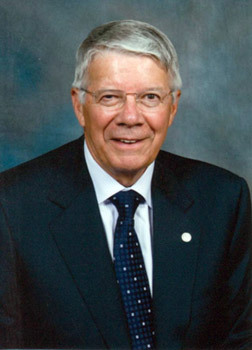 For ten years, founder Cal Nichols served as the Governor and Chairman of EIG. The Edmonton Investors Group sold the Oilers to Daryl Katz in June 2008. Cal has always been driven to give back to the community in which he lives and works. He served as Town Councillor and President of the Chamber of Commerce while living in St. Walburg. He was also captain of the senior hockey team, and in December 2002, the St. Walburg community honoured him by retiring his jersey. In recent years Cal has been inducted into the Alberta Business Hall of Fame, awarded the Queen's Golden Jubilee Medal, and received the Paul Harris Fellowship from the Rotary Club of Edmonton. On December 26th, 2014, it was publicly announced that Cal was awarded the Order of Canada. Personally Cal finds great satisfaction in participating in all of life's adventures within his community and family - especially time with his grandchildren. View the News Articles section to read more about Cal and his achievements.